There is no greater beauty than that of nature at its best. Our wild flower arrangement is a gift that will truly welcome the outdoors into your home. When your eyes rest on this bouquet, you can imagine strolling through that perfect field, plucking pretty blooms with every second step. Perfect for those who want a truly rustic bouquet or something that will remind them of all the times they themselves picked blooms from a wildflower garden. Included in this bouquet, you will find an amazing variety of colours and textures - just as you would in an untamed garden. The contrasting colours and textures of Thlaspi, Lisianthus, Eryngium, Veronica, Daisies, Dragon Snaps, garden succulent and Memory Lane Roses make every inch of this arrangement enticing. We have even included succulents for added allure and this bouquet comes carefully hand tied with rustic, raffia ribbon. 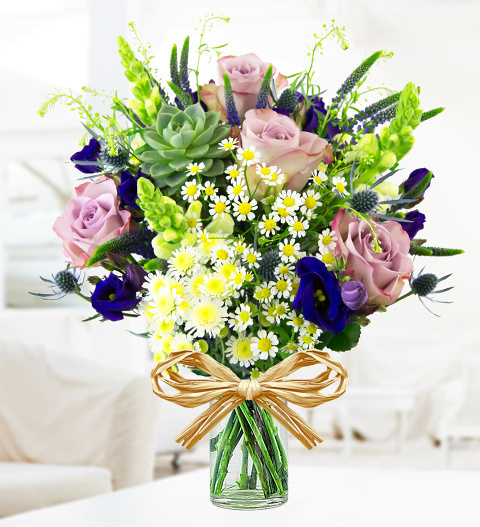 Ideal for all occasions, spoil yourself or a loved one today with this superb collection of carefully selected blooms. Chocolates may contain nuts.